Yesterday was bad, today is great. Once again, the Ying and Yang of life is upon us. Why can’t I stabilize my life? Because life throws you curve balls. Keep you eye on the ball. A good day, though with results. I write a letter home. Today, I discover that I’m playing in a rehearsal of Don Pasquale at the theatre in Schönbrunn Palace. Nothing unusual today, but I’m back to writing German in my journal. An incredibly full day—horn lesson, piano practice, electronic music composition and lecture, Leonard Bernstein rehearsing the Vienna Philharmonic, another Bach Heiler concert, and watching Buster Keaton silent films. I’m still writing in German. The big news—Leonard Bernstein is in town conducting the Vienna Philharmonic in a Mahler series. This is big. 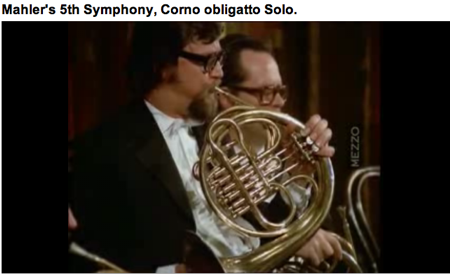 Photos from the 1972 Mahler Symphony No. 5, concert video, today. Was this a full day or what? An incredible day. I’m writing in German again. Damn. Actually, it was probably good for me at the time, though no one would read it and perhaps correct me. I attend a silent film festival dedicated to Buster Keaton. I remember these being very funny.